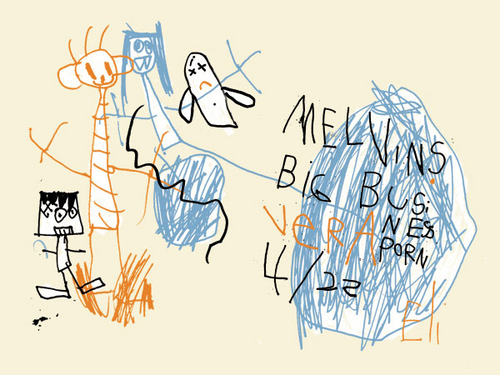 When Dale Flattum was asked to design a tour poster for the Melvins, he hired his son Eli (5 years old) to do the job for him. I dig it. What's even more stunning is that The Melvins are still playing. I'd imagine Buzz to be somewhere in his late 40's by now. I thought Rock N Roll was a young man's game. Still, I owe the Melvins thanks- some of the loudest, heaviest and most painful music that ever punched me in the earhole. 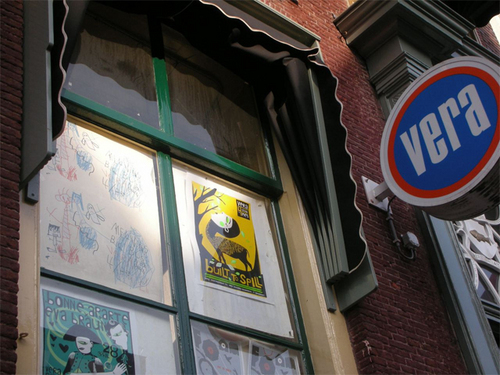 Notice the Built To Spill poster in photo: Antler Boy strikes again! Looks like the art direction on this was perfect. Any idea what the font is? Zimm- Nothing related to the topic at hand. I got an email from you a while ago about some friends coming to Japan. I tried replying back a few times but they all got bounced by the system.... so I finally figured this could be a way to reach you. If you're friends haven't come and gone already, please put them in touch. I'd love to show 'em around a bit. sorry for the delay.